Each year five fellowships for Brazilian students will be granted. Each fellowship will last for three years with the final PhD degree jointly delivered by the academic institutions participating in the program. The starting date of appointment is beginning of September and the deadline for the application is June 30th extended to August 20th. In addition to this program, every year there will be the Erasmus Mundus Joint Doctorate Program with the call deadline middle of February and the traditional IRAP PhD Program with call deadline September 30th. A visitor program for senior scientists from ICRANet centers in Asia, Europe, and USA to Brazilian universities and research centers has been opened. This program is specially directed to senior scientists who have given fundamental worldwide recognized contributions to the field of relativistic astrophysics and cosmology. During their stay in Brazil, scientists will visit universities and research centers associated with ICRANET. Each visitor can spend up to three years in Brazil and each year up to three months. Five positions will be available each year and the applications are opened during the entire year. A program to promote scientific visits of university professors and research scientists from Brazil in ICRANet centers in Europe has been established. During their stay in the ICRANet centers, the scientists will be able to visit the universities and research centers associated to the IRAP PhD Program. Visits addressing both theoretical research and observational activities in ICRANet related centers are welcome. Particularly encouraged are research activities synergic with the IRAP PhD Program through the interaction with IRAP graduate students and Faculty Professors. Each year five positions are established, each one of the duration of five months per year. Applications are opened during the entire year. 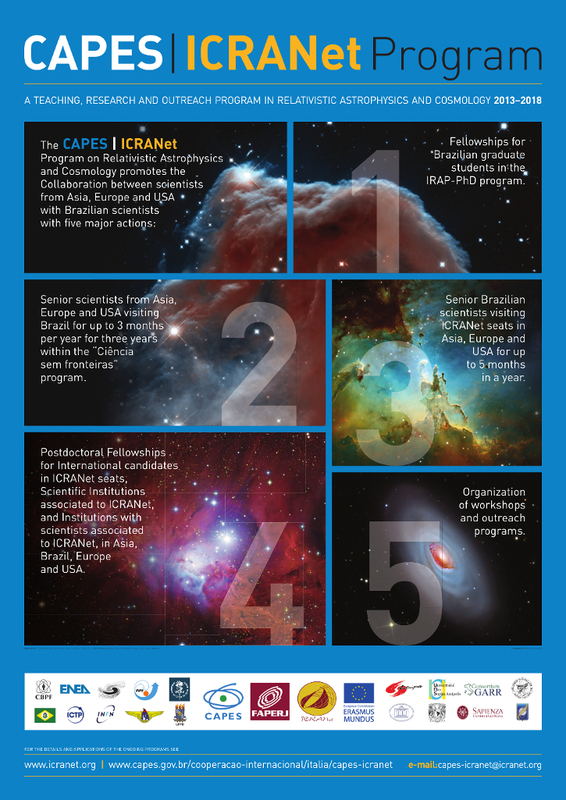 Four two-year postdoctoral positions in ICRANet Centers in Europe and Asia, and five two-year postdoctoral positions in Brazilian universities and research centers with signed collaboration agreements with ICRANet and/or with associated scientists to ICRANet, will be opened every year. The deadline for the application is September 1st of each year. All topics related to theoretical and observational activities or data analysis in relativistic astrophysics and cosmology are welcome.